In June of 1864, twenty three unmarried members of the Ladies Aid Society of the First Church of Belfast, Maine began work on a flag quilt to honor the Maine soldiers who fought for Union during the Civil War. Larger than a standard cot-sized quilt issued by the Sanitary Commission, this 62" x 92" inspirational quilt was stitched with the thought of inspiring hope and displaying appreciation, especially for the sick and wounded soldiers convalescing at the Armory Square Hospital in Washington, D.C. The Ladies Aid Society of Belfast was formed in 1861 after Fort Sumter fell to Confederate troops and patriotic fervor swept through the area. While men enlisted and fought such battles as Antietam, Fredericksburg, Gettysburg, Spotsylvania Courthouse, Cold Harbor the society ladies sewed blue denim pants, flannel shirts, and colored handkerchiefs for their local soldiers. Stitching began on their new project quilt on June 17 and was completed by July 7th. 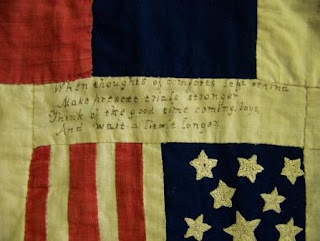 The signature style quilt had symbolic messages, puns, and autographs penned in ink on many of the pieces of fabric. Of the 34 stars displayed on the blue canton, the large white star in its center contains the Lord's Prayer and each of the five points contains a biblical verse drawn from either the old or new testaments. The smaller stars surrounding it represent a battle or campaign in which Belfast soldiers took part. "The noisy Bird, the Northern Parrott"
"Colors That Never Run, Red White and Blue"
"What Soldiers Cannot Be Surprised? Those on Guard." "Hurrah for the boys of the Pine Tree State"
And each to the other forever prove true." "Freemen to arms! Your country's cause in this dark hour demands your aid, God's blessing on the hand that draws in her defence a patriots blade." 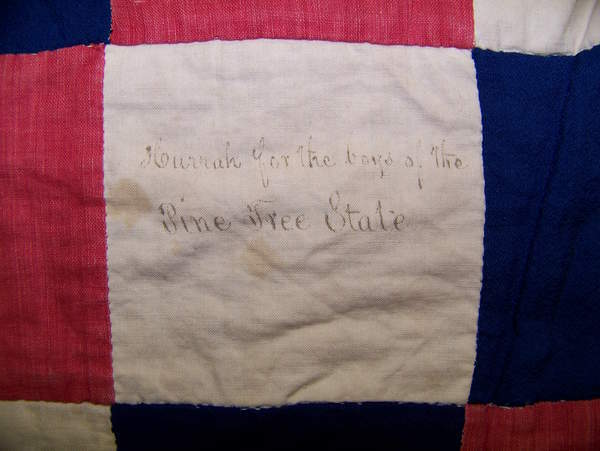 One of lady quilters, Augusta Quimby, wrote in her 1917 Recollections of the Civil War "that the quilt was finished during the afternoon, and was displayed in the dining room and was much admired.” Augusta remembered that “A picnic supper was served, to which the young men were invited.” The following week the Belfast Civil War Soldier's Quilt was sent to Ward 26 of the Armory Square Hospital in Washington, D.C.
And wait a little longer." Who knows how many soldiers had been encouraged by the Belfast flag quilt at the Armory Square Hospital by the time the war concluded. But as the war ended, the hospital closed and came into the possession of chief surgeon Dr. D. Willard Bliss. In 187 his daughter married a man who was appointed Special Indian Agent in the Dakota and Montana territories. It remained in the family until in a remarkable circumstance of fate, or providence, it was found amongst an estate in 2011. "Our Star Spangled Banner. Long May It Wave"
The quilt was salvaged and upon inspection, the date and location of its makers and origin was discovered on the top stripes: U. S. G. Society, Belfast, Maine, June 17, 1864. Nearly 150 ears after it had left on its mission, the quilt was returned to Maine in care of the Belfast Historical Society. 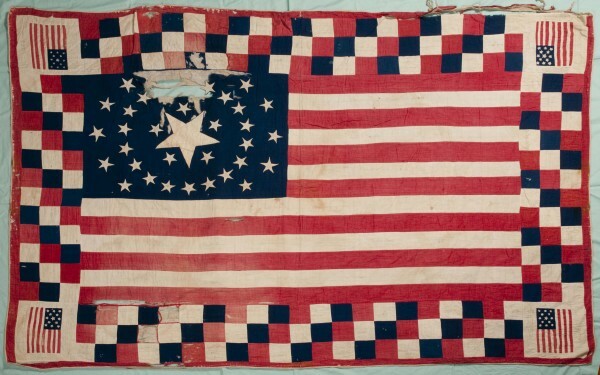 Of the 250,000 quilts stitched for the Union army during the Civil War, only about twenty still exist. "Our Country and Liberty! God for the right." GIVEAWAY! In honor of the liberty that inspired the ladies who created this beautiful flag quilt ~ I'm giving away a copy of my quilt themed novel, set in the years leading up to the American Revolution. 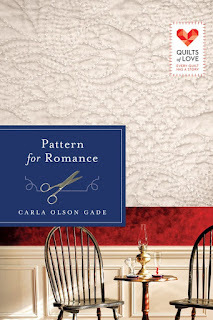 One commenter will win Pattern for Romance!! What is one way YOU show your patriotism? Honour Metcalf's quilting needlework is admired by a wealthy customer of the Boston Mantua-maker for whom she works. In need of increasing her earnings, she agrees to create an elaborate white work bridal quilt for the dowager's niece. A beautiful design emerges as she carefully stitches the intricate patterns and she begins to dream of fashioning a wedding quilt of her own. When Honour is falsely accused of thievery and finds herself in a perilous position, merchant tailor Joshua Sutton comes to her aid. As he risks his relationships, reputation, and livelihood to prove her innocence, the two discover a grander plan. I have no specific way that I show my patriotism, no special holiday celebrations, but I pray for my nation and its' leaders. Connie, that is very patriotic. We can still be patriotic even with our quiet activity of prayer. This is quite interesting! Thanks for sharing this story. I'm glad you enjoyed reading about this special quilt. 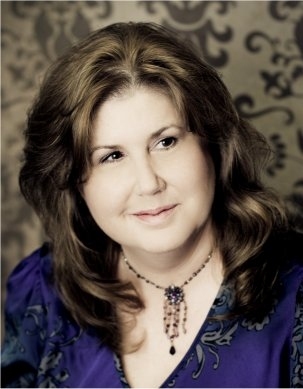 Wonderful post, Carla! Thank you for bringing this to us. Thank you, Susan. I was hoping you'd catch this post since I know how much you love Maine history. I am flying my flag and stand with my hand over my heart when singing the national anthem. At this time, I don't have other things that I can think of that I do, but I am very proud to be an Amercian. Thanks for the giveaway! You are welcome, Betti. I'm flying my flag, too! Thanks for visiting. Great post, Carla! Thank you for sharing! Thank you Carla for such a fascinating post! What a neat back story to this quilt. I can't believe it somehow survived for over 150 years to make it back home to Belfast, Maine! 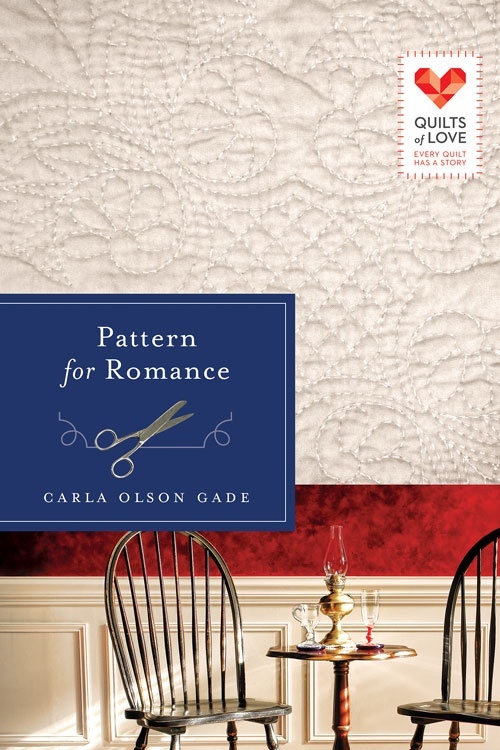 Thanks for the chance to win a copy of Pattern for Romance - it has been at the top of my Quilts of Love TBR list since it came out!